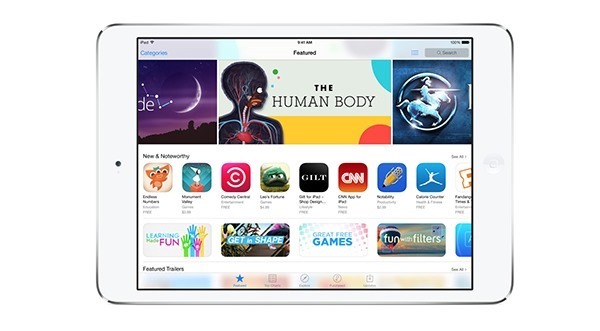 Following on from the news that the cost of Apple’s Developer Program would be increased in certain markets, including the United Kingdom and Germany, it has now been revealed that App and Mac App Store pricing structure will also be adjusted (read: raised) across much of the European Union, as well as Canada. The new prices will come into effect from tomorrow, and a full run-down of affected nations can be seen below. All EU nations will be hit by the price hike, as well as Norway, which despite being a part of Europe, is not, in fact, a member of the European Union. Canadian iOS and Mac users will also be hit by higher prices, although there is a crumb of good news if you happen to reside in Iceland. 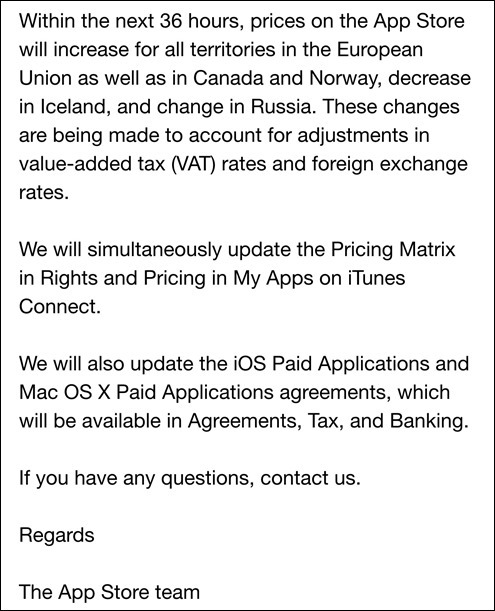 For while many will begin paying more got their apps and games from January 9th, the Icelandic market will actually be treated to a reduction, and while there will be alterations in Russia, Apple’s official correspondence fails to mention whether costs will be upped or decrease. If there was ever a bad time to push such an increase, it would be January. After the holiday season of overindulgence and, for many, overspending, a purchase of a new app wouldn’t even cross most folks’ minds. For Apple to go ahead and bump the cost, there’ll almost certainly be some kind of backlash, whether it be a show of dissent or in a lack of subsequent purchases, and one has to wonder of the potentially detrimental implications on Apple’s ecosystem as a whole. Then again, it’s worth pointing out that the cost of Apple’s hardware is significantly higher than that of comparable brands, and thus any consumer unable to cope with minor adjustments to generally low-cost apps perhaps shouldn’t be buying Apple in the first place. Unlike the increases to the cost of the Developer Program, which seemed rather hefty to say the least, Apple has stressed that the tweaks relate to changes to VAT and exchange rates, so in essence, the company’s hands are tied. Those of you in affected areas, will a slight increase in app cost have you thinking twice about making App Store purchases? Do share your thoughts with us in the comments section below! It’s not Apple’s fault that European and Asian currency isn’t worth what it was…man especially Russia, you expect them to just keep losing money with the devaluation and do nothing? They aren’t the most valuable company in the world by being charitable and cheap…running a profitable company means keeping those profits healthy. As if they didn’t charge enough for their BS already. Did you really just said that? Get your currency facts right first. Euro are worth more (than US), unlike what you just said. You really thing they are loosing money? The company is getting greedy that’s all. When the US dollar goes the other way, Apple doesn’t lower their prices.